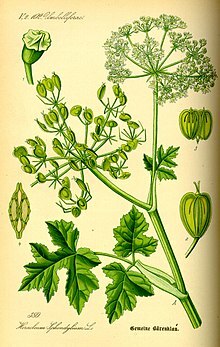 Heracleum persicum, known as Golpar or Persian Hogweed, is a flowering plant. It grows wild in mountains. Golpar seeds are used as a spice in Persian cooking. These seedpods are slightly bitter. They are usually sold in powder and are often sold as "Angelica Seeds." The powder is sprinkled over beans and potatoes. Golpar is also used in soups and stews. It is often sprinkled over pomegranate seeds. Golpar is also mixed with vinegar into which lettuce leaves are dipped before eating.